The children really enjoyed threading the blocks onto the string  they exhibited their creativity by making it into a snake and pulling it around the room! The pieces were a good size, well made and sturdy and we liked that the laces had a hard end to make it easier for the children to thread. It is a great activity for developing hand-eye coordination and also for building colour, shape and number recognition. Both sorting and building block games teach children to categorise and match different objects, which promotes spatial awareness, concentration and requires strategy and logic, important for maths and science subjects. The children, unaided, spoke about the shapes of their blocks and some of them ordered the numbers, which develops numeracy skills in counting and ranking. Adult interaction provides even more scope for discussions and learning about different shapes, numbers, colours and patterns. The best way to improve on fine motor skills and hand to eye coordination is to have fun whilst doing it. 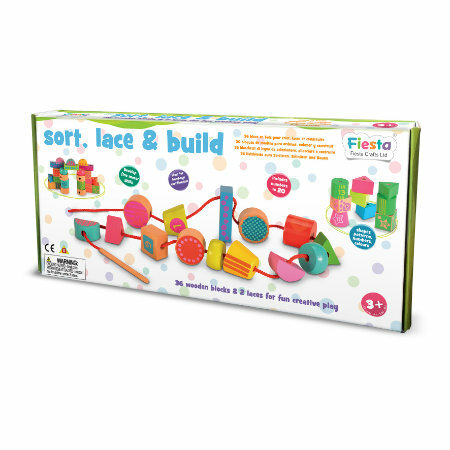 The Sort, Lace & Build contains 36 wooden blocks perfectly sized for little hands. Suitable for three years and older, young children will love sorting these colourful wooden blocks in a variety of ways - including shape, size, colour, number and pattern. Each block is chunky and easy to hold  perfect for little fingers! Not to mention the assortment of shapes that are available  from round to rectangular, square to triangle, and all brightly decorated  the creative possibilities are endless! To lace the pieces together thread has a wooden rod at the end to make it easy to pass it through each piece. Or children can choose to stack the pieces into different shapes and structures. This activity is a great way to work on their spatial awareness, as well as their motor skills. Each piece is decorated with a pattern, number, or both. The numbers go up to 20 making the Sort, Lace & Build a great toy to help consolidate basic mathematical skills also! Plus all the pieces can be packed away and stored neatly in the box thanks to the easy to open and close box lid.